Brrr…things have got chilly, and everything’s frozen in ice! Head over to the Frozen Diamonds slot by Rabcat for your chance to break into the ice blocks and release those precious gems. There could be some worthwhile rewards for you too. 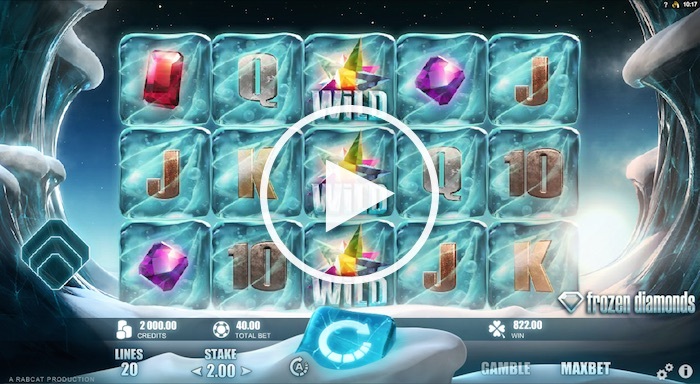 Open up the Frozen Diamonds slot by Rabcat, and you’ll enter a mysterious world, of gems encased in blocks of ice. The graphics instantly transform you into an icy world, and the accompanying music also has a slightly eerie and mysterious feel to it that helps evoke the feeling of an icy cave. This online gaming slot has five reels and 20 paylines and features a range of betting options, from 20p per spin to £40. It’s fun and easy to play, with minimal concentration needed. It’s one to consider loading up after a hard day at work when you want to relax, unwind and chill out. The icy graphics and atmospheric sound will certainly provide the chill factor! As already mentioned, the graphics on the Frozen Diamonds slot are highly evocative and instantly create the desired icy atmosphere. They also have excellent clarity and nicely designed. What’s more, the graphics work well across a range of mobile and tablet devices, and you certainly don’t lose any of the detail through playing on a smaller screen. Regarding playability, this online slot game gets full marks for drawing the player in. It’s easy to get started, and you’ll soon get the hang of the rules and winning combinations. The ‘freefall’ style, where icy blocks fall and create winning lines, then new blocks fall to fill the spaces, is similar to that found in other popular UK slot games such as Gonzo’s Quest and Big Bad Wolf. 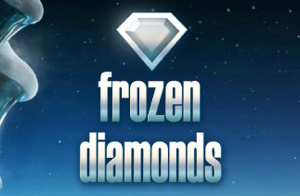 If you already like those slots, then the chances are you’ll love the format and style of Frozen Diamonds. As you’d expect, there is a range of symbols featuring precious gems and diamonds. We thought there could have been more, but they’re bulked up by the usual offerings of the 10, J, Q and K symbols. The four gem symbols are purple (we assume an amethyst), red (ruby), green (emerald) and an amber colour (representing the diamond). The all-important wild symbol is a magnificent star-like gem, featuring a myriad of rainbow colours. The wild symbol can represent any other symbol in the game and help complete those all-important winning lines. It makes sense that winning combinations of the gems net the highest winnings. For example, depending on how much you bet, three purple amethysts could bag you £24, four rubies could win £160, and five diamonds could see you walking off with £2000. There are some good winnings to be had! All good slot sites for UK players need games that have enticing features, and Frozen Diamonds doesn’t fail to meet that expectation. One of the highlights of this online slot is the free spins and extra free spins features. So if you get three consecutive winning combinations in the game, then you’ll randomly be awarded either five or 10 free spins. With two to three wild symbols in the third reel during every first fall of free spins, there are plenty of opportunities to boost your winnings. If you get a winning combination during the second bonus fall of your free spin rounds, then you’ll be rewarded with another free spin, doubling all winnings. There’s a good level of betting in the Frozen Diamonds slot. You can start out comfortably at 20p per spin and up your bets as your budget allows. If you’re looking to go wild and try the maximum bet, then it stands at £40. Don’t worry, though, there are plenty of options between the lowest and highest rate, so you’re sure to find a level that’s comfortable for you. The slot does have an additional Gamble feature too, so you could take an extra gamble with your bet if you wish. Just click on the ‘gamble’ icon down in the bottom right-hand corner of the screen. Regarding the average return to player (RTP) payout rate, Frozen Diamonds is fairly good. It has an RTP of about 96.47%. 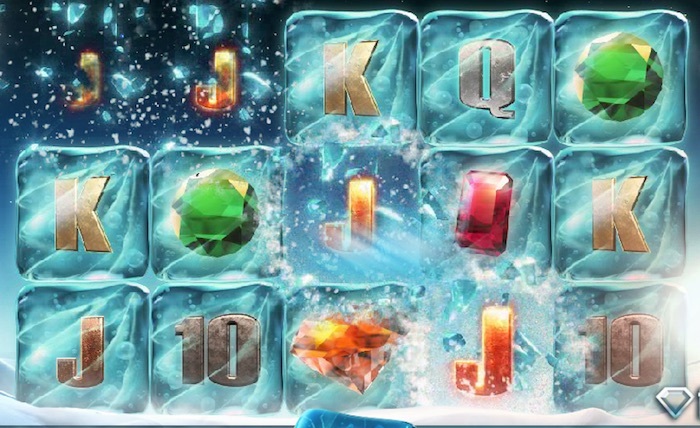 Finally, we like the theme of the Frozen Diamonds slot, and there’s no denying that it’s cool and icy! The graphics are well produced and appealing to look at, while the game play is enjoyable. If you’re lucky, the winning combinations and extra spins can prove to be pretty lucrative. Of course, the best way to judge an online slot is to play it for yourself! So why not head off now and get those icy reels spinning?